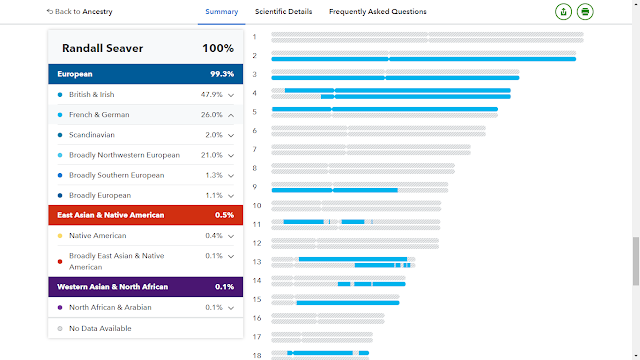 23andMe announced new features today to its autosomal DNA Ancestry Composition feature (which includes ethnicity estimates) - see their blog post 23andMe Adds 1000+ More Regions and 30+ New Reports for the Most Refined View of Ancestry To-Date. I wondered if my Ancestry Composition had changed since I last posted about it on 1 January. Nope, it hasn't changed a bit. Disappointing, but then I'm "almost" 100% European. 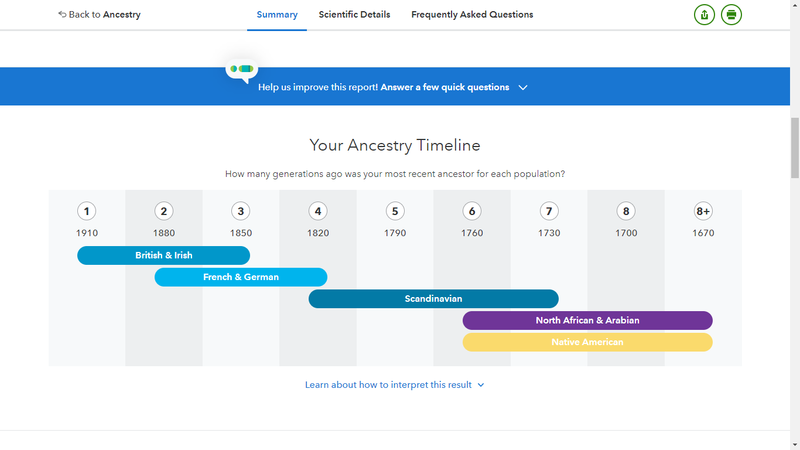 3) Further down the screen, here is my "Ancestry Timeline:"
The article said this may have changed. I agree with the British and Irish" time frame, but the "French and German" time frame is probably too late (all of my known German lines came before 1750), and I have no clue from the paper trail who my "Scandinavian," "North African and Arabian," and "Native American" ancestors are. 4) Down the screen, the next section concerns how much I inherited from my parents. This is really an ad to entice you to test your parents. Mine are deceased. 5) The next section is about "My Connections." 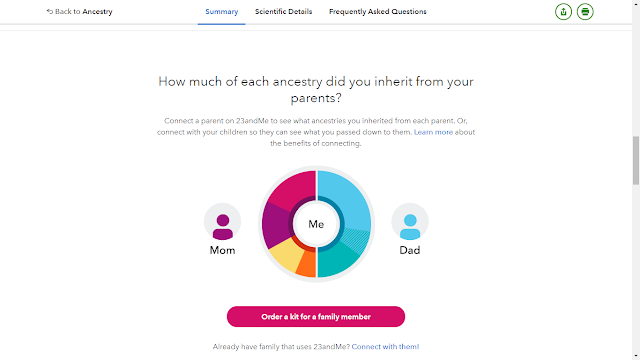 I can see the same "Ancestry Composition" for one of my DNA Matches. I didn't bother. 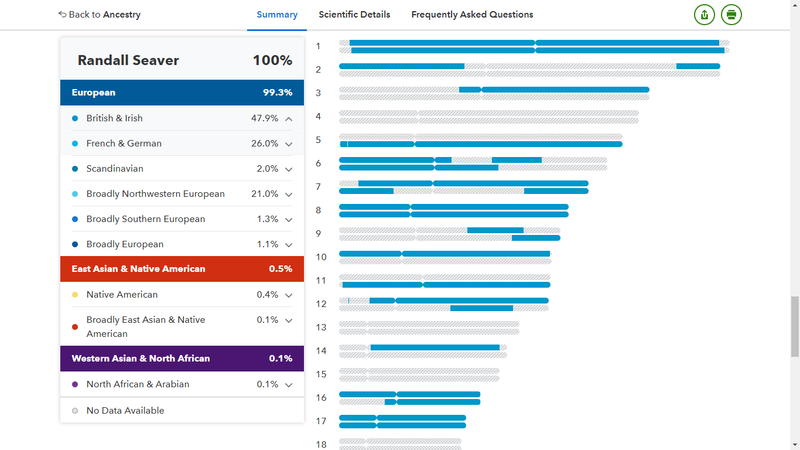 The screens above use the assigned colors for each ethnicity group and paint them on the 22 pairs of autosomal chromosomes and my X chromosome (from my mother). This useful information to me. 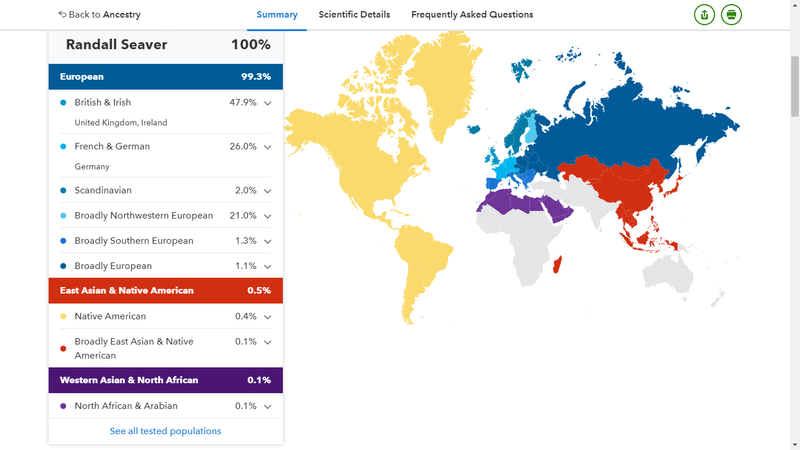 a) By running my mouse over one of the ethnicity sub-regions, I can see which part of each chromosome was derived from that sub-region. I can see from this that both of my parents had British and Irish ancestry on most of my chromosomes, but not all of them. I'm not surprised since my paper trail says my father is about 100% British and my mother is about 50% British and Irish. 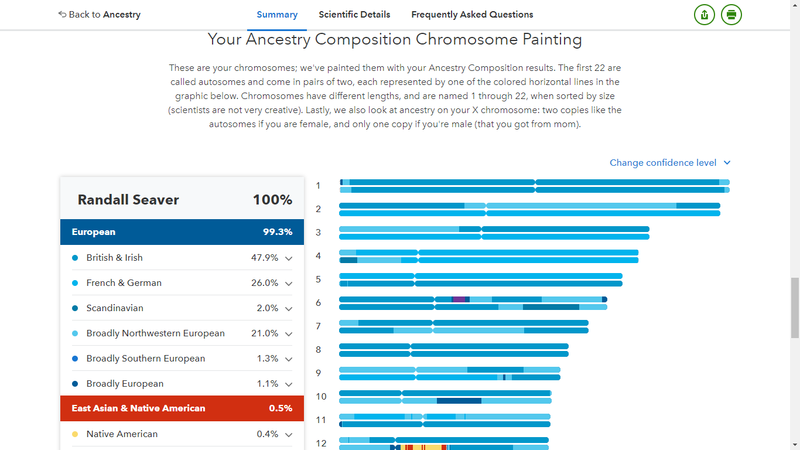 I was surprised that there are several chromosomes where both my mother's and father's has French and German ethnicity. 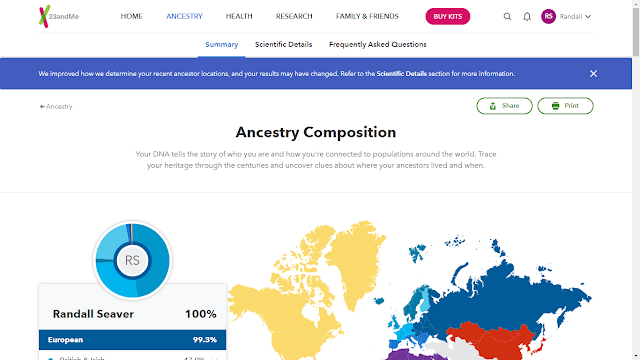 My paper trail indicates that my mother has about 45% French and German ancestry, but my father has none. Chromosomes 4 and 6 have some Scandinavian segments. My paper trail shows my mother has one Scandinavian ancestor from the 1600s. d) Some of the French and German and Scandinavian may be derived from the Jutes, Angles, Saxons, Vikings, Normans, etc. that invaded the British Isles over thousands of year. e) My "North Africa and Arabian" ethnicity segment is on one of my Chromosome 6, and I have no clue who that may be. However, it is on the other Chromosome 6 from my Scandinavian segment. 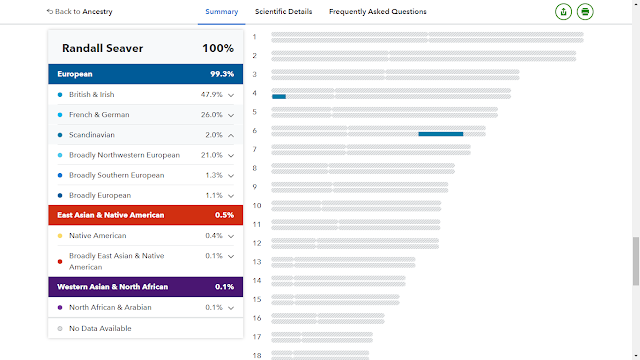 f) My "Native American" ethnicity segment is on one of my Chromosome 12 which has British and Irish and no French or German. I think that this may be on my mother's Canadian ancestry from the 1700s. I really like this type of presentation, but I can't see all 23 chromosome pairs on my screen when I highlight an ethnicity. I could reduce the screen to about 75% I guess. Obviously, identifying the ethnicity of a chromosome segment is based on the reference groups that the testing service uses. GIGO. 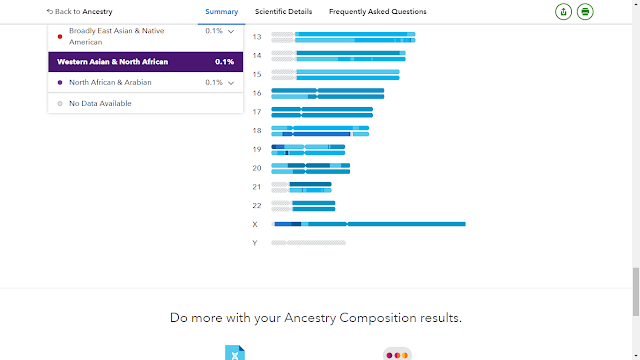 7) It appears that the "new" Ancestry Composition features on 23andMe don't add much new to my own composition. The ethnicity estimates haven't changed, but there are other new features in the blog post that provide explanations and stories to explain the composition to users. Disclosure: I paid for my 23andMe autosomal DNA test back in 2011, and have received no material considerations from 23andMe.